Hard Rock Cafe’s first Global Charity Partner Hamish Dodds, President and CEO of Hard Rock International, and Annie Balliro, Senior Director Global Brand Philanthropy, partnered with us in hosting and launching the Hard Rock Feed A Child campaign rolling out in 50 countries in November 2007. This was a tremendous gift to us as a charity with Annie and Hamish being outstanding Ambassadors. Working with the international team of Hard Rock staff, they hosted 3 concerts, in Times Square New York, in Park Lane London and Mumbai, India, running the campaign in every Hard Rock Casino, Hotel and Cafe around the world. We are now feeding and educating 3,500 children on three continents as a direct result. Bear Grylls, Natasha Bedingfield, Sean Kingston, Darryl McDaniels (Run DMC), Daniel Bedingfield, Lamont and Martha Redbone performed at the launch of Global Angels US in our Step Up America Concert in Times Square, New York, November 2007. The event was an outstanding success. 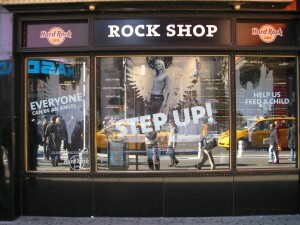 Hard Rock Cafe generously hosted us in their Times Square venue, and we received television coverage through VH1 and Fashion TV, and on countless radio stations. Media covering the launch included a four page feature in Hello Magazine. For 5 hours, celebrities Stepped Up in front of our Angel with their live photo shoot being shown on the NASDAQ, Reuters and MTV screens in Times Square. David Fischette and Jayme Laforest from Go West designed and created the visual spectacular on the screens, very generously donating their expertise and time.